The City of Hollywood offers a wide range of amenities for rent, perfect for any sporting event, concert, special event or just for a family outing. With locations all over the City, there is no shortage of rental options to help make your day exactly what you envision it to be! 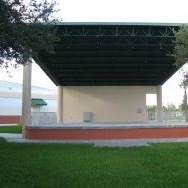 Concert Venues: Along with the ArtsPark amphitheater, Boulevard Heights Community Center also offers rentals of their open air amphitheater. Community Centers: Community centers all over the City offer a variety of different sized meeting rooms and auditoriums for any sized gathering as well as indoor gymnasiums for rent. Pavilions: Pavilion rentals are available at our parks throughout the City to help make your event, park outing or picnic perfect! Athletic Fields: Athletic facilities for rent include beach volleyball courts and fields for football, soccer and baseball. Mobile Stage: The City of Hollywood's mobile stage is available for your event locations. ArtsPark: ArtsPark is steps away from the downtown area and perfect for any event with its open air amphitheater, grassy "meadow" and "grove," 2nd floor patio, meeting room and studio.